It’s great that laptops are getting thinner and thinner, but not everyone wants to sacrifice all their beloved ports in order to achieve that thinness. We love USB-C as much as anyone else, but that’s not the ONLY port we want on our new laptops. Notebook computers like Apple’s MacBook Pro and Google’s Pixelbook (which is on sale right now at its lowest price ever!) ditch every other port and include only USB-C ports. What about USB-A? What about Ethernet? What about HDMI and memory card slots? 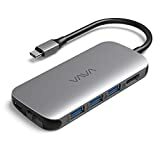 The VAVA VA-UC006 USB C Hub Adapter brings all that and more back to any laptop with a USB-C port, and it’s on sale right now at its lowest price ever if you use the coupon code TZV6YFJX at checkout.